Your transaction is safe and secure. Your trust is something that is earned by us everyday. Audio Bible has been verified as the owner or operator of the website located at BibleBible.com. The identity of Audio Bible has been confirmed using official records. Audio Bible is a Verified PayPal user. 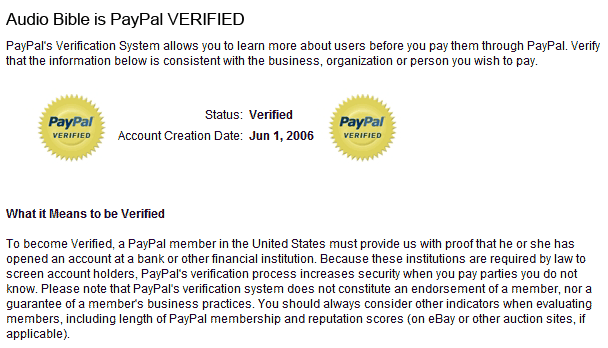 In addition to increased security, buyers and sellers value your Verified status because it indicates you have passed PayPal security checks.